Knowing that the Cuesta Art Gallery’s latest show is called “Genesis” has a weird way of coloring one’s interpretation of it. Laura Krikfa’s oil painting of two boys, titled A Song for the Fields, suddenly represents Cain and Abel. Her mixed-media Fallen Woman is Eve. 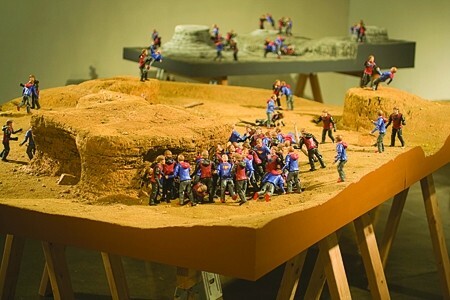 Clovis Blackwell’s Time of Trial, in which myriad tiny identical figures battle across a rugged terrain? That must be a nod to God, creating mankind in his likeness. But these interpretations start to fall apart once you realize all these works were created separately, with no overriding theme in mind. Six recent MFA graduates were hand selected to show their work in the gallery; the theme, I gather, evolved (is that the right word?) somewhat later. TIME OF TRIAL : Part of a larger body of work, this piece by Clovis Blackwell parodies the notion of having superpowers. “I didn’t actually know about the show title until maybe two weeks ago,” artist and former Cuesta student Clovis Blackwell admitted to New Times. His work, Time of Trial, however, was a project spanning two years. Blackwell’s plastic figures, on closer inspection, are broken superheroes engaged in wars with no discernable good or evil sides. 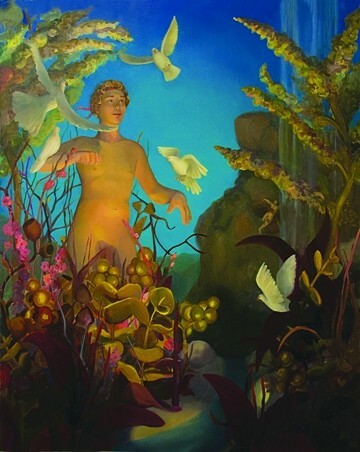 Blackwell’s contributions to the “Genesis” show are two of four pieces in which his figures duke it out in various settings. 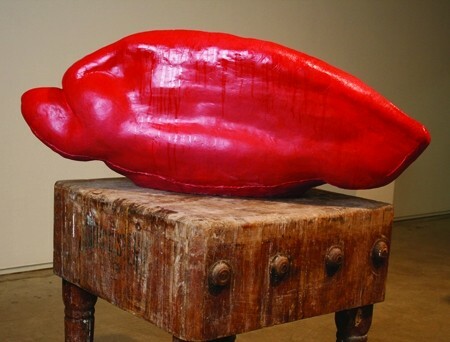 Time of Trial, explained the artist, is a reaction to his previous body of work, titled “Vincible,” which dealt with suffering, illness, and disability. Blackwell suffers from rheumatoid arthritis, an illness he says is mostly under control these days. Yet its scars remain, in the form of permanent damage to his fingers and wrists. GANYMEDE : Laura Krifka bases many of her oil paintings on clay models she makes herself. The fighting figures, Blackwell said, represent the warring factions of his own psyche. Having spent several years on the super-Clovis, Blackwell has moved on to the subject of mushroom clouds, which he describes as the marker point for that moment of struggle between an ending and a new beginning. Apocalyptic myths have circulated just as long as hero myths have, Blackwell went on. 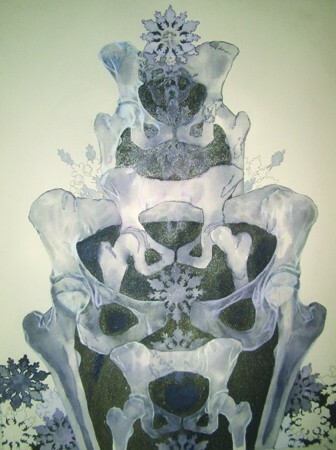 FAMILY CREST : Rebecca Erbstoesser drew her nestling pelvises using stencils, graphite, and gel pens. Blackwell happens to be a born-again Christian, something he believes is represented in his artwork. However, he added, Christianity and its symbolism are such an influential part of our culture, it’s inevitable that some aspect of them will continue to manifest in the art world—whether the artists mean for it or not. Superman, for example, was Jesus repackaged for the 20th century. In the Death of Superman comic, Blackwell said, one image in particular inspired his piece Time of Trial: Superman’s lifeless body in the arms of a woebegone Lois Lane. But Blackwell’s work isn’t the first thing to catch the eye of a passerby who chanced to roll into Cuesta’s art gallery. That honor may well go to Sandi Escobar’s Taco Tongue, a muscled hunk of anatomy, which, amplified to the size of a kitchen sink, is grossly seductive. Escobar’s La Forked Tongue is exactly what it sounds like—a tongue pulled two ways, suspended from the ceiling. Born in Los Angeles, Escobar grew up speaking Spanish, she explained in an artist’s talk, and she first began learning English in kindergarten. Consider that “tongue” and “language” are synonymous in Spanish, and the image becomes an extremely visceral representation of bilingualism. Laura Krifka, who works in oils, clay, and mixed media, loves imagery “so joyful and happy that it starts to be creepy and disturbing,” she explained. Her cutely sinister works draw from old musicals, pioneer women, and Greek mythology. A SONG FOR THE FIELDS : Laura Krifka’s work draws heavily from Greek mythology, old musicals, and stories of pioneer women. George Pfau, like Krifka, focuses on the human figure in his work. 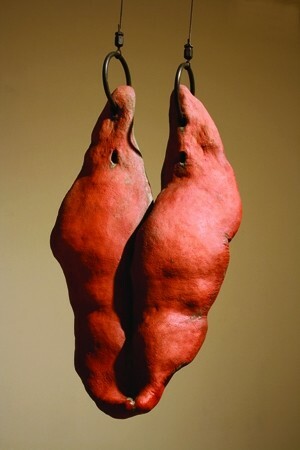 But while Krifka builds clay models and paints them, Pfau is more interested in merging 17th century medical drawings with zombies, or, as he puts it, “bodies on the verge of recognition.” Works like Permeable Membrane Magnified and Penetrated Core take archaic, dry, textbook illustrations and infuse them with subtle humor. THEY REST ON SUNDAY … AND SATURDAY: “Genesis” exhibits until Feb. 16 at the Cuesta College Art Gallery, open 11 a.m. to 4 p.m., Monday through Friday. Like one of those movies you have to see a couple of times to fully “get,” Cuesta’s current exhibit is rich, layered, and alive. Alia Malley presents pigment prints of Los Angeles’ fallow grounds: places once scarred by industry, but now wild, overgrown. Rebecca Erbstoesser—working in gel pens, graphite, and gouache—shows works like Family Crest—three pelvises inside one another like Russian nesting dolls. Erbtoesser’s Madonna of Peace relies heavily on stencils, belying the illustrative talents she once plied in the service of Disney. You could, like many viewers at the show’s well-attended reception, spend all day ruminating on how each of these pieces, in its own way, fits the show’s theme of Genesis, the beginning of the world. Blackwell, though, is already occupying himself with the apocalypse. Arts Editor Anna Weltner is a German-speaking doll. Send stackable Annas to aweltner@newtimesslo.com.